To someone who has never tried making or eating savory oats, they might sound a little strange. Usually, when we think of oatmeal or porridge, we see sweet fruits and spices folded into the creamy grains. But, believe me, savory oats hit a spot of filling satisfaction that sometimes the sweeter can’t really give. I love to incorporate veggies into mine to bring it full circle. This dish is similar to Vangibath, south Indian breakfast dish. Dry roast urad dal, red chillies, clove, cinnamon, pepper corns for 2-3 minutes on a medium low flame, allow it to cool . Once cool place the roasted ingredients with peanuts, curry leaves in a food processor/blender and ground to a fine powder and set aside. Dry roast oats in a pan on a medium flame for 2-3 minutes while stirring often to avoid them from burning. Once done turn off the flame and set aside. Heat oil in a pan add mustard seeds, as it splutters add cumin seeds, curry leaves, onion and saute for a minute or two or until translucent. Add auberging/eggplant , tamarind pulp, salt and saute for 4-5minutes/until tender. Now add 2cups of water and bring it to boil on a medium heat. As the water comes to boil add roasted oats, lower the flame and stir the oats every minute or so, as they tend to burn the bottom. And cook together for 4-5 minutes (adjust the consistency as per the taste) as the oats will soak the moisture up for the perfect texture. Now finally stir in the ground spice powder 1-2tbsp (or as per the spice preferred) . Turn off the flame, garnish with chopped cilantro/coriander and serve warm. Spices and the consistency can be personalised as per the taste. 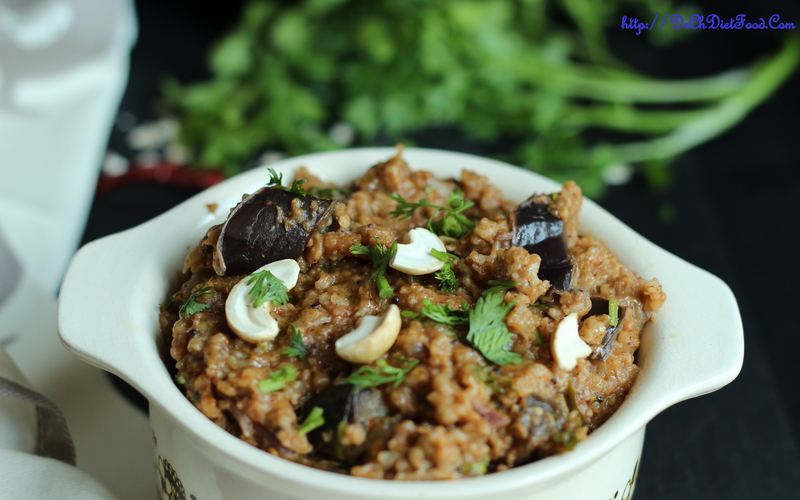 Posted on November 24, 2015, in Breakfast, Indian, International and tagged Aubergine recipes, Chitras healthy kitchen, drchdietfood, easy healthy breakfast ideas, Eggplant, Indian oats recipes, Indian recipe, oats, oats breakfast recipes, Oats Vangibath, savoury oats porridge. Bookmark the permalink. 54 Comments. Thanks Vidya…nice to hear such compliments on Monday morning..
Vaangi bath with Oats!! very interesting…..
very innovative, Chitra! looks very yummy! Andy – Am missing your feedback and visit…I am doing 2-3 posts/week now.. Mouth watering. 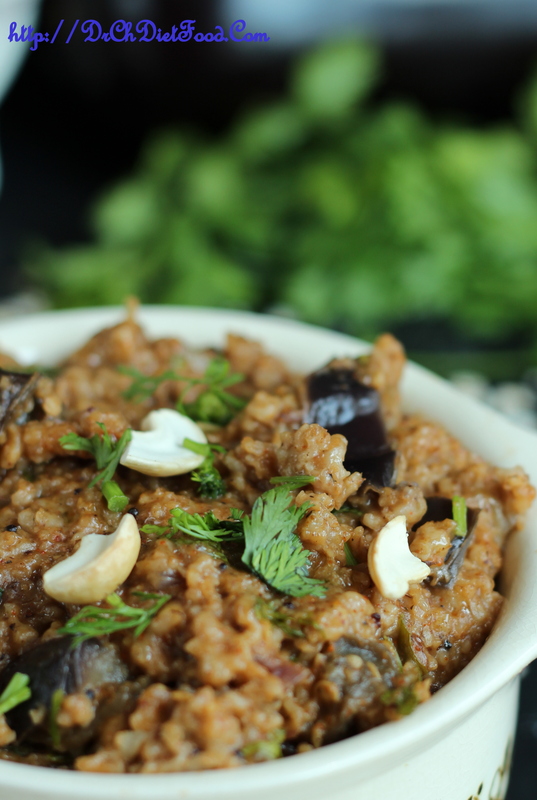 love the oats eggplant combo! Oh my gosh! This sounds so interesting! Thanx a lot…. glad you liked it…. I have to bookmark it! It’s similar to vangi bath where I have used oats instead of rice and glad you liked it dear Lynz…. thanx a lot. ..
Thanx a lot for stopping by and appreciating me with your lovely comment…. This looks like a great comfort dish for our cooler days! Chitra oats vaangi baath, I can never think of such innovative ideas!! You are awesome!! Thank you Ch…glad you liked it. I love how you transform traditional dishes into healthy ones! vaangibaat with oats amazing chitra. 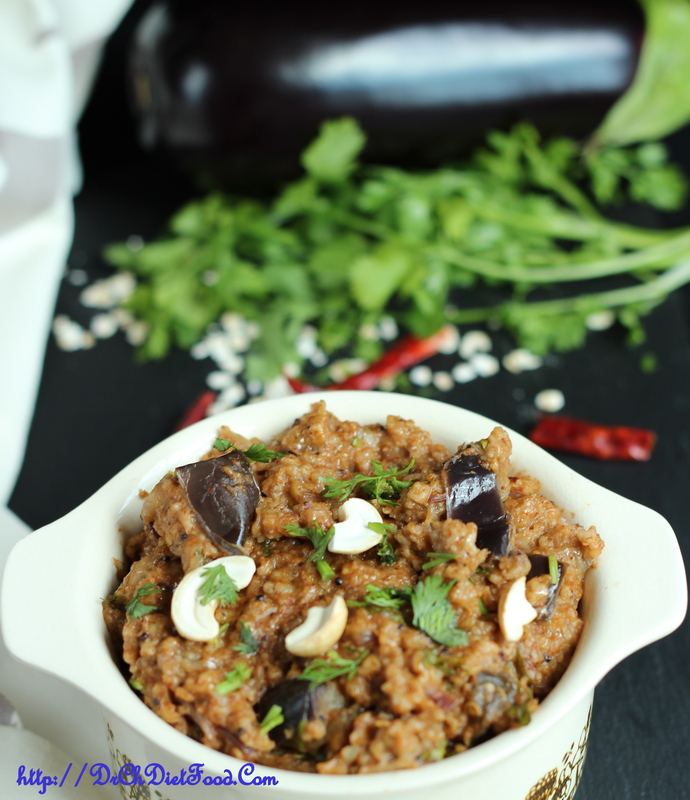 One of my favorite Indian dishes is with eggplant. Your recipe looks tasty. Thanx a lot Jackie…. your support and encouragement boosts me up each time…. Nice meal Chitra. I use oats in bread too, it is healthy too and it fills up the stomach very fast. I agree Chitra, just not too much, because they contain much fat too.